Accurate identification of insect pests is essential to effective control. This is especially critical when wood-damaging insects invade your property. The U.S. Environmental Protection Agency estimates that more than two billion dollars is spent annually on treating wood-damaging pests. While other insects can be nuisances, wood-damaging pests compromise the structural integrity and value of your home. The very nature of these pests complicates identification, because they're often concealed in the wood they damage. If you suspect a wood-damaging pest is at work behind the scenes, these clues can help you I.D. them and respond effectively. Carpenter bees drill almost perfect circles in wood. 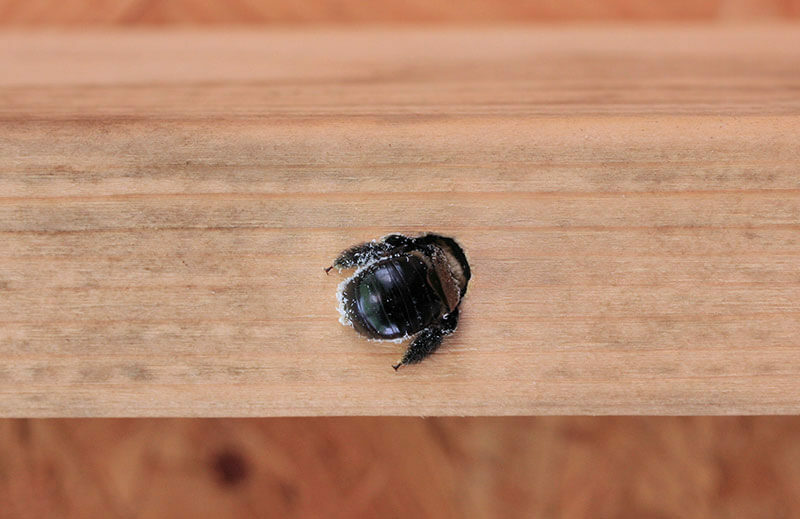 Carpenter bees are found throughout the United States, but their structural damage is especially prevalent in the eastern half of the country. In nature, carpenter bees seek out wood in old trees and stumps. However, they may target homes and wooden structures too. When they do, their damage is unmistakable — and it can be severe over time. Carpenter bees don't eat wood; they excavate nesting tunnels. Their distinctive entry holes, about the size of a fingertip, are almost perfectly round. The bees excavate about 1 inch deep, and then branch off to create lateral pathways where they lay eggs. Related bees stay together, with offspring adding their own entry holes and nesting chambers each year. Over generations, extensive damage occurs. All types of bare, unpainted wood become carpenter bee targets. Redwood siding, cedar shakes, weathered pergolas, and wooden windowsills and eaves are all fair game when nesting time comes. Piles of coarse sawdust can be found below new holes. You may hear rumbling, burrowing sounds within wood. Areas below holes usually show dark stains; carpenter bees often defecate as they enter the holes. Carpenter bees are often mistaken for bumblebees. However, bumblebees nest in soil, not in wood, and are more interested in flowers. These two native bees are similar in size — about 1/2 to 1 inch long. Bumblebees have fuzzy yellow and black abdomens, but carpenter bee abdomens are shiny and black. Male carpenter bees don't sting, but they will dive at onlookers aggressively. Smooth-walled galleries in wood indicate carpenter ants have been at work. Carpenter ants are found throughout North America, causing damage to homes in many regions, but the humid East and Northeast are especially hard hit. Normally, these ants seek out dead trees and decomposing wood in nature, but when homes offer moist, decaying wood, carpenter ants move in. They rarely invade dry, solid structures. Unlike termites, carpenter ants do not eat wood. They excavate tunnels, known as galleries, where their colonies live and reproduce. The long, parallel channels have very smooth sides, free from sawdust and debris. Piles of wood particles and sand-like sawdust appear nearby as byproducts of their excavations. You may hear muffled, rustling sounds in walls. The first hint of carpenter ant infestation may be trails of large, dark ants leading into your home. Warm spring days bring out groups of dark, winged, reproductive ants up to 3/4 inch in length. By the time colonies reach this stage, they've been in place for years. A few ants indoors may indicate foraging ants from an outdoor nest. Large numbers inside, especially near windows, signal trouble. Follow ant trails for clues to their nesting spot. Focus on any damp areas, indoors and out, with large, dark ants nearby. Carpenter ants are often mistaken for termites, especially when winged, but these pests have distinct differences. Carpenter ants have defined waists, jointed antennae, and front and hind wings of different lengths. Termites have none of these features. 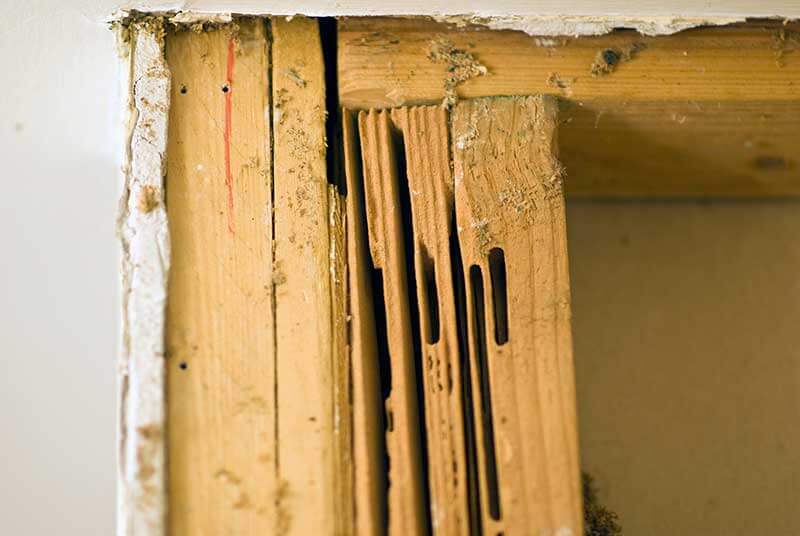 Termites often go undiscovered until extensive damage occurs. 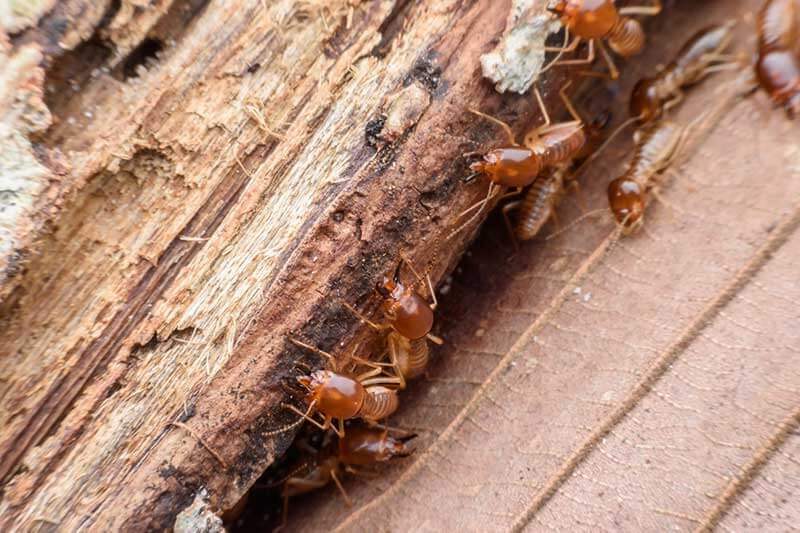 Termites cause more structural damage in the United States than any other insect. Subterranean species are the most destructive. They're found throughout the United States, but the Southeast and California have the heaviest infestations and sustain the most damage. The warmer mid-country and southern-tier states follow close behind. Unlike carpenter bees and carpenter ants, termites eat the wood they infest. Cellulose, from wood or other plants, is their primary food. As their name indicates, subterranean termites live below ground in the soil. They travel through soil to reach wood, seldom venturing into view. They often go undiscovered until extensive damage has been done. The first sign of termite problems are often swarms of winged, reproductive termites or piles of wings they've shed and left behind. Spring swarms of winged termites, about 1/2 inch in length, indicate well-established colonies that may number in the hundreds of thousands. Close inspection of the insect reveals its distinctive physique. Termites have cigar-like bodies and straight, non-jointed antennae. Their front and hind wings are of equal lengths. Subterranean termites nest where wood and moisture are plentiful. Look for sand-like, tubular passageways traveling along walls or pipes, connecting soil and wood. When tapped, infested areas sound hollow and empty. When probed with a screwdriver, their exteriors fail and reveal termite galleries inside. Unlike smooth-walled carpenter ant galleries, these are lined with soil and greyish-brown excrement. No sawdust piles exist — just remnants where wood once was. Prompt, effective treatment of wood-damaging pests is critical to preventing destruction of your home and property. AMDRO Quick Kill Carpenter Bee, Ant & Termite Killer is unique because it kills all three of these major pests, as well as other wood-damaging insects listed on the product label. It also prevents new infestations for up to three months outdoors and up to 12 months indoors. When wood-damaging insects strike, you can put a quick end to their destruction. AMDRO is committed to helping you protect your home from pest damage and disruptions, so you and your family can rest easy and get back to enjoying your home. Always read product labels thoroughly and follow instructions carefully. For active infestations, professional inspections are recommended.